Some of us contacted Sarah Bascom when she started this website for a few reasons. 1. The intention when they rolled it out was confusing and we wanted to make sure that we were supporting the right thing. 2. We’ve been doing this for a long time. We’re the ones that have been documenting, blogging, protesting, writing and keeping this issue alive. We, being the River Warriors. We wanted to offer our help so this would succeed. We were asked at one point to help to find businesses that would join in the Coalition to support the EAA. We were so appreciative of the Everglades Coalition. Especially after the amazing meeting in Key Largo this year. For myself I felt like there was solid support of the big guns and we could accomplish this for sure. I privately asked a lot of people who was behind this website and what was the point and most people did not know. So I emailed Sarah who basically blew me off. I know others did also and she blew them off. I felt at the time she was trying to accomplish something good and just left it alone. “One source for money to revive the water-farming contracts was money from the taxpayers from the rest of the state, via the Legislature. But the water district’s governing board, under state law, is not allowed to hire its own lobbyists to pursue funding. There are more. I’ll find them later. Sarah Bascom, spokesperson for the Support the EAA Reservoir Project Coalition, an actual stakeholder with something meaningful to say, thought so too. “This is absolutely ridiculous and, quite frankly, embarrassing for these two groups to have hired paid actors to pose as protesters who ultimately had no idea what they were there to oppose,” wrote Bascom in a statement Thursday. If Sarah had been paying attention she would have learned that the actors that were paid were also duped. Those actors thought they were filming the back drop of a tea party piece. Sarah Bascom. Shame on you for not doing your homework. 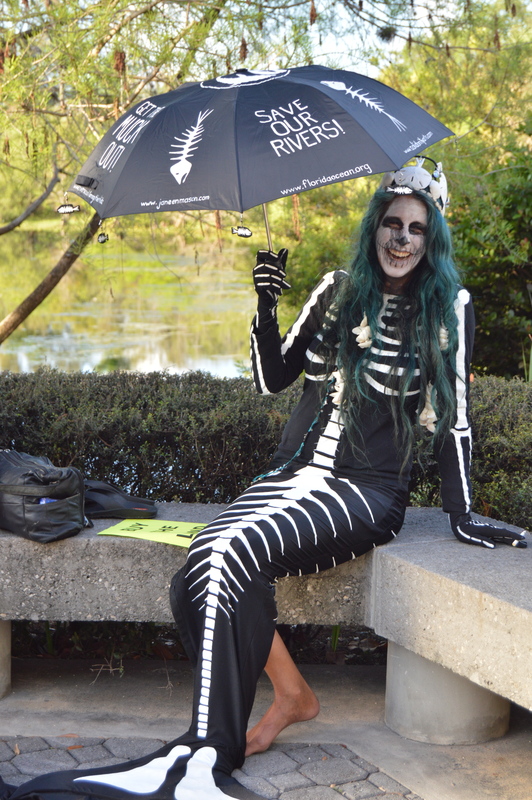 Our death mermaid is a dedicated water advocate. Probably one of the most compassionate and creative people I know. Did you get confused about who you were working for? Please do your home work and understand the issues. Until then find someone else to represent the people are being decimated, by the water we have dedicated ourselves to protect and the everglades we have dedicated ourselves to saving. For us this is not a client. It’s our lives. With friends like you we will surely get toxic discharges forever. ← Who paid the 3750? Well. I don’t see anything wrong with Sarah’s quote. The problem is with Stpetersblog where it appears. She, herself makes no reference to Mermaid; it is the stuffy author of the piece who does. Sarah worked – or works – for Alico and Senator Negron? We may think them unsavory connections, but their hardly the only – or the worst – such connections in the broader environmental movement. she called linda a paid actor when in fact she is a dedicated, creative water advocate who is affected to her core from the discharges. she owes her an apology. Sarah owes linda a written apology. btw we have known who else she works for for months. she is a pr firm and it certainly her right to work for who she wants but its also her responsibility to do her homework in a situation as serious as this. That’s my issue. She doesn’t do her homework. I have more examples but i don’t even want to go there. To say we have no idea what we are talking about is beyond the pale. We, the people who have been working on this issue day and night. Thank you Cyndi – for so quickly coming to the defense of one of the most active and sincere water advocates I know…. Linda Curtiss. The River Warriors are a group of people who have been spending THOUSANDS of hours and their own money fighting for clean water. If we don’t have the money, we have car washes, bake sales and fundraisers. This group of people have been to Washington DC, Tallahassee, Orlando, Ft. Myers, the Florida Keys….. the list is extensive… all to learn more about the issues at hand and to educate others. We all have had to take time out of our lives and off of work…. some losing jobs and friends along the way…. And none of us are getting paid. Linda is a wonderful representative of who we are and what we stand for. Just because she dresses up as a “dead mermaid” doesn’t mean she doesn’t know her issues or shouldn’t be taken seriously. It means that she is SICK OF THOUSANDS OF US BEING IGNORED. When you see Linda – it makes a statement. It catches your attention….and we all know how vital it is to get air time/media coverage. I can’t even imagine how hurt Linda must be feeling right now. I bet she feels hurt and angry because she CARES! She has been eating/sleeping/breathing this clean water fight for YEARS and is one of the most dedicated people I know. I agree with the author of this piece…. SHAME ON YOU SARAH BASCOM. In in this piece he takes a quote by PR spokesperson Susan Bascom in which she refers to “two groups” hiring actors, by which she means the two Tea Party and Koch aligned groups based in Miami who hired the actors, and makes it seem as if both environmentalists and Tea Party groups had hired actors. This is is not true, Schorsch probably knows it isn’t true, and uses a transparent writing device to a familiar end; discrediting the progressive Left. IMHO, Susan Bascom is not the enemy. Sarah Bascom is the same kind of friend to the environmental movement as the folks Kevin Powers told us were the River Warriors best friends- SFWMD, the legislature, and the governor. If you go to her website she touts her Republican connections. Lobbyists in Florida are required to register with the state, identify their clients, and report their billings on a quarterly basis. Ballard Partners is a long-time lobbyist for Martin County. Martin County’s expenditure for Ballard’s executive branch lobbying in the last quarter of 2013 was listed as less than $9,999. Ballard’s billings to U. S. Sugar for the same quarter were listed as between $40,000 and $49,999. If U. S. Sugar has interests different from Martin County’s on environmental and water issues, for example, how does the lobbyist reconcile that conflict without favoring one client over the other. If money talks, one suspects more money talks louder. One issue where Ballard represents corporations with deep pockets and interests that are clearly contrary to those of Martin County is All Aboard Florida. “Our” lobbyist also represents Florida East Coast Industries and Fortress Investment Group LLC. Both businesses are listed as paying between $20,000 and $29,999 quarterly for Ballard’s services. Effective representation of our interests by the people we pay in Tallahassee, for both our politicians and our lobbyists, should include opposing Rick Scott’s $123 million ($215 million over two years) budget request to pay for a train depot at Orlando Airport. This expenditure would primarily benefit All Aboard Florida. If we hear silence on this budget request and are told instead that the project is inevitable and we should seek help paying for quiet zones, we know our best interests are not being served. There may be some value in maintaining long-term relationships in Tallahassee, but that’s not likely to be true unless the relationship is mutually beneficial. Political PR pro Sarah Bascom of Bascom Communications has officially launched the search for communications director and press secretary for the Republican Party of Florida, continuing in her capacity as interim communications director. The post below just hit online via Bascom Communications’ Facebook page and Bascom’s personal page but my phone is already ringing with people interested and asking advice on how to land the gig. Applicants should understand that this job will be a high-profile position, with a national spotlight on the RPOF because at least one of its favorite sons will likely be running for president. But it is a prime opportunity for GOP press flacks. If you think the treasure coast is going to get billions and we are going to deny Miami and Orlando hundreds of millions you got another thing coming. Politicians can count, and the power bases are the cities and their reps.
john maloney- still have no idea what your talking about billions of dollars. surely your not talking about buying the land so the water can go south and saving the drinking water of entire south florida? No one is denying anything. What do you have against Carl? He did a great job as state rep for water. Cleaned up the lake worth inlet and tributaries in Jupiter. He has a pretty solid record and before it was fashionable or the papers covered it. Big murph voted for AG subsidies, wrote a letter in support of AAF during the comment period and then bailed on us. Carl would have been the better choice, this term patrick is dedicating to his senate run and we have no meaningful local representation. We dud btw about the Obama signs . People were so confused the demsz were stealing for their yards.